About | EURLYAID - E.A.E.C.I. a par­tic­i­pa­tive asso­ci­a­tion of per­sons, inter­est­ed in issues of ear­ly child­hood inter­ven­tion. a work­ing par­ty made up of rep­re­sen­ta­tives of par­ents’ asso­ci­a­tions, pro­fes­sion­als and researchers, from var­i­ous coun­tries of the Euro­pean Union. Eurlyaid was found­ed in 1989, dur­ing an inter­na­tion­al con­fer­ence, in Rot­ter­dam. Eurlyaid became the Euro­pean Asso­ci­a­tion on Ear­ly Child­hood Inter­ven­tion in Rome in 2003. Increas­ing the qual­i­ty of life for par­ents and chil­dren with spe­cial needs, through ear­ly child­hood inter­ven­tion (with­in the con­text of inclu­sion and gen­der main­stream­ing). Stim­u­lat­ing the growth and devel­op­ment of ear­ly child­hood inter­ven­tion on a Euro­pean lev­el. Increas­ing sen­si­tiv­i­ty to the val­ues and ethics of ear­ly child­hood inter­ven­tion, as described in the Man­i­festo. Increas­ing knowl­edge and exper­tise in the field of ear­ly child­hood inter­ven­tion. Mak­ing acces­si­ble the knowl­edge, expe­ri­ence and exper­tise in ear­ly child­hood inter­ven­tion to par­ents, pro­fes­sion­als, researchers and prac­ti­tion­ers. Pro­mot­ing the exchange of infor­ma­tion, expe­ri­ence and exper­tise, in a man­ner acces­si­ble to every­body, by cre­at­ing a Euro­pean Inter­net Com­mu­ni­ty. Increas­ing the devel­op­ment of good prac­tice. Sup­port­ing exist­ing ideas of good prac­tice and net­works in ear­ly child­hood inter­ven­tion and act­ing as a ref­er­ence sys­tem. Ini­ti­at­ing sci­en­tif­ic research in the field of ear­ly child­hood inter­ven­tion. Ini­ti­at­ing dis­course about train­ing-pro­grammes for pro­fes­sion­als. Organ­is­ing con­fer­ences, sem­i­nars and sym­posia. 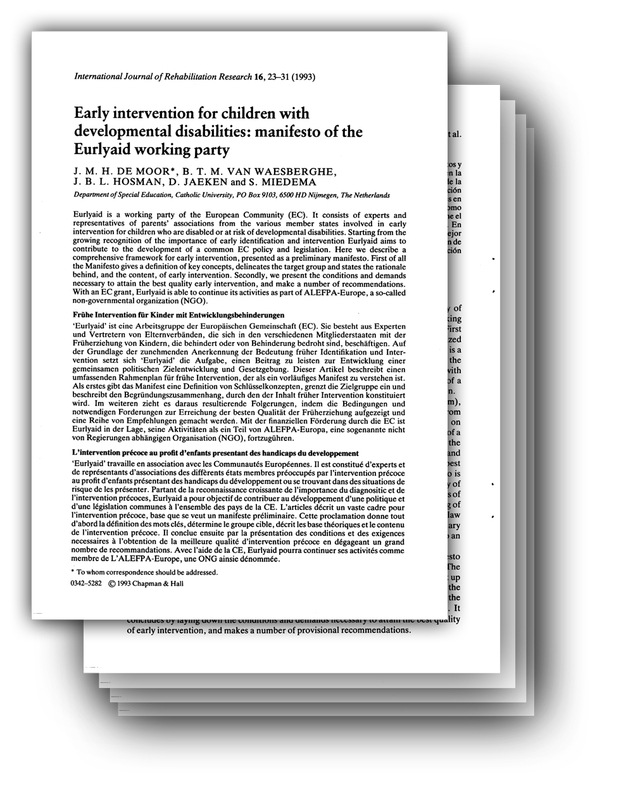 Enhanc­ing the pub­lic pro­file of ear­ly child­hood inter­ven­tion. Key con­cepts of the EAE­CI — are writ­ten down in two “Man­i­fests”, which can be down­loaded from the web site of the asso­ci­a­tion. The EAE­CI is an Inter­net based asso­ci­a­tion, with free online mem­ber reg­is­tra­tion.